Today we come to the magical story of Cinderella. We find the young ragged looking girl meeting her fairy godmother. What comes next in the story? You are probably expecting the fairy godmother to save the day. Well, that is almost how it happened. She was about to until the intervention of Rumplestiltskin. Before Cinderella’s eyes her fairy godmother turns to smoke and we see her wand fall. Rumplestiltskin tells Cinderella not to be frightened and that he will give her what she wants and will not require any payment….until a later day. An eager Cinderella accepts his offer without knowing what lies ahead of her. She is transformed into the dazzling beauty we all know and uhm, love. Now as most fairy tales go the next step is the fair maiden catching the heart of a prince. Cinderella’s charms capture the heart of Prince Thomas. Even Snow White and Prince Charming attend this lovely wedding. As Cinderella is enjoying her night, an unexpected guest arrives. Rumplestiltskin tells her in time he will take her first child as payment for the life he has given her. Later, a desperate pregnant Cinderella is caught by her husband packing her things in attempt to sneak off. He wants to know why she would want to leave him. She admits to him the deal with Rumplestiltskin. Prince Thomas has truly fallen in love with Cinderella. 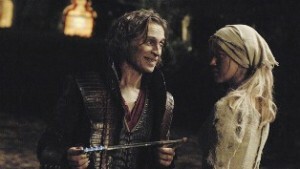 He tells her they will find a way to defeat Rumplestiltskin. A plan is hatched to catch Rumplestiltskin and lock him in a prison where he cannot use magic. Cinderella is told that she will be the one who will trick Rumplestiltskin. She is scared but the prince reminds her how Rumplestiltskin cannot pass up a deal. The plan is she will offer him a new deal and have him sign a contract using a charmed quill. Therefore, Cinderella and Rumplestiltskin meet. She tells him she is pregnant with twins and is willing to surrender both. She concocts a story that the kingdom is becoming poor because its land is infertile and she wants him to make the crops grow again. Her act is to make him believe she is more interested in wealth than having the babies. Rumplestiltskin has an idea this may be a trap but as her husband predicted he cannot pass up a deal. He uses the magical quill to sign and all his magic is suspended. Rumplestiltskin will be carted off to prison and tells Cinderella he will take her baby. Cinderella tells Prince Thomas she wants to name the baby Alexandra. She suddenly starts feeling pain and Thomas runs to a well to get her some water. Once Thomas is out of sight, the pain ceases and she calls for him. He does not return. She goes to find him but the only trace left of him is his cloak. She goes to the wagon holding Rumplestiltskin and demands to know where her husband is. He tells her all magic has a price and again says that he will take her baby. Emma and Henry share a moment as she escorts him to his school bus. They are coming up with code names I will not know about. Graham sees Emma and has the audacity to offer her a job of all things for the wonderful work she did finding John Doe. She takes his card without accepting. I later make a stop at Granny’s Diner where Emma now seems to frequent. I tell her I do not care about her relationship with Henry because I found out she leads a transient life and I do not expect her to stick around. I then throw in how she will just end up walking out of Henry’s life disappointing him and should make a clean break. I must have gotten to her because as I leave she spills some of her drink on herself. She asks if she can use their laundry room at the diner and meets Ashley. Ashley is actually the pregnant Cinderella and she is in the laundry room crying. She tells Emma no one wants her to keep her baby because people do not believe in her. Emma gives her a pep talk about how she should not listen to anyone and has the power to change her life. Later that night Mr. Gold surprises Ashley when he catches her breaking in at his pawnshop. She tells him she is taking control of her life and she pepper sprays him. He falls and passes out. She takes something from his pocket and runs off. It’s Saturday night. I am doing my makeup and getting ready for a”city council meeting”…at least that is what I tell Henry. I tell him that he needs to stay home and not leave this house. Of course, as soon as I am gone he takes off. We flash over to Mary Margaret’s place. Emma is there going through a box while Mary Margaret makes them some breakfast. Mr. Gold shows up and seeks the help of Emma. He tells her that Ashley has something that is of value to him and he would like her to help track her down. He says he will not go to the police at this point. Emma agrees to help him to keep Ashley out of trouble. Henry arrives and sees Emma with Mr. Gold, which he does not like. He tells Emma how I will be gone most of the day and they can hang out. Emma finally agrees he can come with her to find Ashley. They go by Granny’s to see Ruby so Emma can ask her about Ashley. Ruby tells her how Ashley’s boyfriend abandoned her during the pregnancy. Once Emma convinces Ruby that she wants to help Ashley she is told to try speaking with Ashley’s ex. Emma goes to meet Sean who is actually Prince Thomas. His father who is really, the King in Fairy Tale Land does not want to help Emma. He believes Ashley and this baby will ruin Sean’s life. Emma can see that Sean’s father is the one causing all of this and Sean wants to help Ashley. She then finds out that Sean’s father made a deal with Mr. Gold to take Ashley’s baby in exchange for money. Henry and Emma leave. He tells her that Ashley cannot get out of a deal with Mr. Gold. Emma goes back to Ruby who has given Ashley her car to escape. Emma again convinces her she wants to help and that Ashley should not deal with Gold alone. Ruby admits Ashley is headed to Boston. Emma goes to find her and discovers Henry has still not gone home but has been waiting for her in the car. She takes him with her. Ruby’s car is crashed on the side of the road and Ashley is found by Emma going into labor. They take her to the hospital even though Ashley wants to go to Boston to escape Mr. Gold. Ashley wants to keep this baby. Emma tells her is she keeps the baby she can never leave. Of course she says all this in front of Henry so who knows what he is thinking. Emma tells him now that she knows what is going on he is not getting that baby. First, he threatens to go to the police and then he comes up with another plan. He tells Emma he will let Ashley keep her baby if she is willing to make a deal with him. She asks him what he wants and he tells her she will owe him a favor. The next thing to happen was shocking to even me. She accepts his offer! Emma has accepted a deal with Mr. Gold without even knowing what her half of the deal will be!! I was just as surprised as you are. Emma and Henry go to Ashley’s room. She is grateful for Emma’s help with Mr.Gold and has named the child Alexandra. That is the same name Prince Thomas wanted to name the baby in Fairy Tale Land. Sean shows up at the hospital to reunite with Ashley and meet his daughter. They will have a happy ending at Emma’s expense. We now flash over to my “council meeting” which is actually a rendez-vous I am having at Granny’s Bed and Breakfast. I am getting dressed and remind my lover to take his socks from under the bed. I’ll tell you who it was in a moment. I’ll bet you are dying to know. Just before I get home, Emma has managed to get Henry back. She tells him her code name will be Pumpkin. Emma tells Henry she is not leaving and will see him tomorrow. He gets to his room before I can even see he was gone. Emma calls Graham to tell him that she will accept his job offer. Graham hangs up and retrieves his socks from under the bed. Now you know Graham is my mystery lover.